I am 31 years of age, teacher at a local private school and dedicated member and servant in Shofar Christian Church Swakopmund. At the school I have a grade 5 as register teacher and teach Natural Science as main subject in it. Other than that I teach Physical Education in grades 3-7 and Religion and Moral education in grades 5-7. Other than that, I lead a small group with teenage girls who I disciple and have the privilege of leading and accompanying into a vivid relationship with Jesus Christ. Also I am part of the intercessory group in my church and lead the Outreach and Missions Ministry. Here a summary of what went on throughout this year in the outreach and missions ministry. I pray you enjoy it and am looking forward to another year of serving our Lord and Saviour Jesus Christ! On June, 2nd 2012, with a backpack full of Bibles and other evangelistic material we went to the wood crafters market where we had been reaching out before (see other reports on this blog). 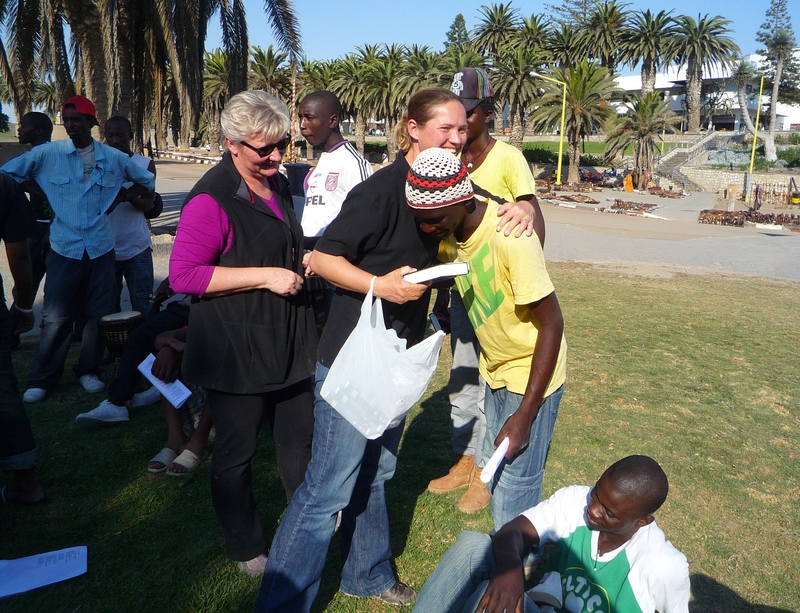 There we met with Carol-Ann, who had even more Bibles for us and Leon and Dorette. 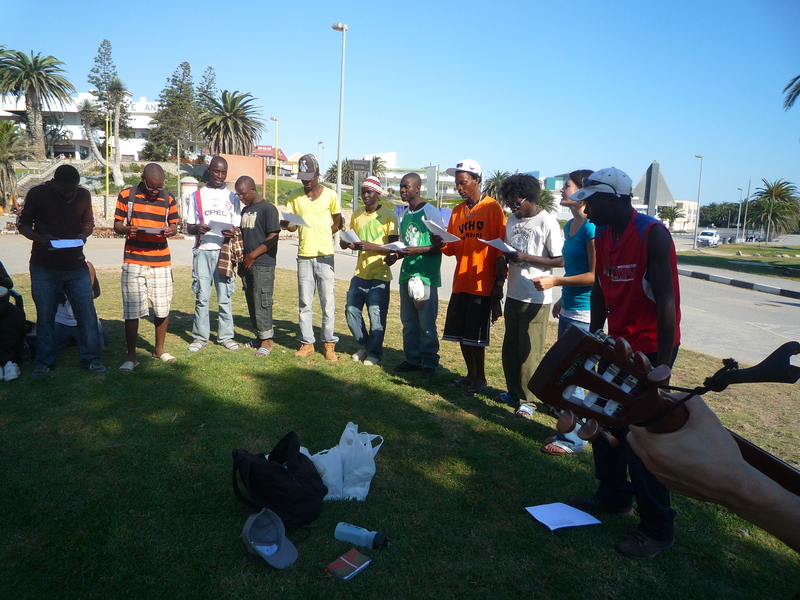 We gathered and singularly invited everyone, then got together and started with singing “Jabulani Africa”. Many new faces were among those we had met before and the message was simple: God has a plan for everyone. The vital question of where we spend eternity. The problem. God’s love. The most important decision. Romans 3:10 + 23; John 3:16; John1:12. They listened, the Holy Spirit translated and they followed every part of the message as God gave it to everyone individually. It is God’s love that compels us… and the fear of the Lord that keeps us from sin. The BIBLE gives us the direction, it is the message of God and it is the LIVING Word! We spent a good 30-40 minutes with them when I we prayed for salvation. I then asked those who had just gotten saved to be brave and rise with me. 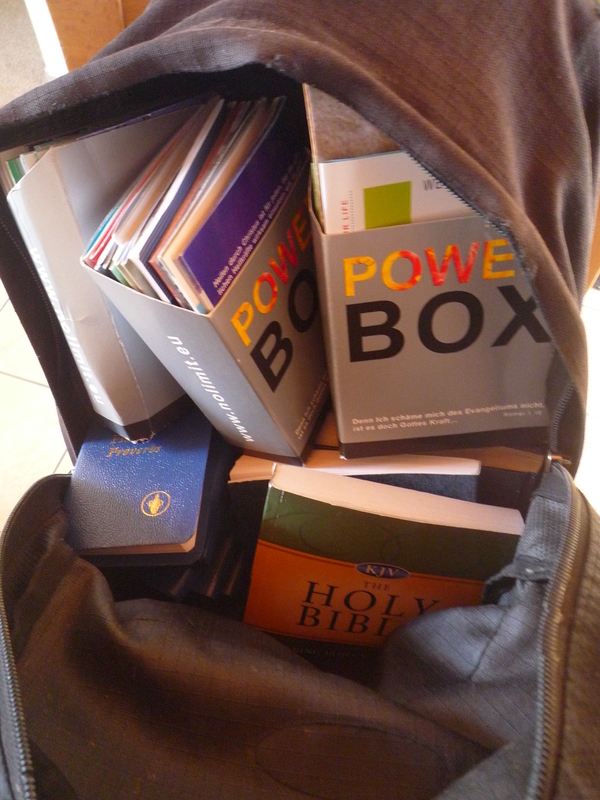 One of our aim was to give them/ equip them with the first Bibles. We congratulated them on their decision, welcomed them, hugged them…as new members to the Kingdom of God…and brethren. With every step there was joy unspeakable… some young men had joined us though they were just passing by gotten saved and now they are brethren. GOD had a plan for them…for today! We received their contact details to help slot them into a local church and stay connected. Then we distributed the rest of the Bibles to those that were saved already and had joined us today. 14 got saved that one day…every single one precious to God and to us. It marvels me to see how God chooses to work… when we decide to avail us to Him. And even though sometimes we are reluctant to go… as our flesh doesn’t “feel like it” it happens to become the time of a lifetime! Carol-Ann who joined us for the first time said afterwards she hadn’t had a better afternoon in 20 years! She and her husband run a Christian radio station and have agreed to donate Bibles on a regular basis now. I just LOVE how God works! Letter summarizing the results of the G.O.D. Millions of Christians proclaim the Gospel around the world! • 6 Million Christians proclaim the Gospel around the world! • Over 25 Million people reached! • 3 Million decisions for Christ! • Woman awakes from coma! • Blind woman from Switzerland can see again! A.E. Adeboye (30,000 RCCG churches in 161 countries), Ché Ahn (10,000 HRC-churches), Wayne Alcorn (ACC Australia), Alpha, Mark Anderson (Call2all), Richard Ciaramitaro (Canada), Loren Cunnigham (YWAM), Global Day of Prayer (Prayer Network of 350 million Christians), Global Media Outreach, Suzette Hattingh (Indonesia), Mathew Kuruvilla (Heavenly Feast, India), Samuel Rodriguez (40,000 Hispanic churches in the USA), Russian Union of Christians, Russian Church of Evangelical Faith Christians, Royal Rangers, Robert Stearns (Network of 300,000 churches in 178 countries), Márcio Valadão (Brazil), Bill Wilson (Metro Ministrie USA ), and many more. The official start of the Global Outreach Day was during the Holy Ghost Service in Lagos, Nigeria, on the night of June 1st. The G.O.D. was the talk of the town, having been made known through newspaper articles, banners and internet presence. I could feel the excitement and the great expectation in the one-mile-long building where we met and where I shared about the launch of the first ever worldwide evangelistic day. The meeting was aired on television in Africa. While it was already June 2nd in Samoa and the first outreach activities were beginning to take place, over a half a million Christians in Africa were praying together for the G.O.D. Then a wave of evangelism spread around the world. Shortly after midnight in Nigeria about 1,000 people followed an invitation to give their lives to the Lord. • Pakistan: Tens of thousands of Christians met boldly in public places, schools and universities and even at police stations and preached the Gospel to Muslims. • Brazil: More than one million Christians were active in over 300 cities. One local church in particular passed out over 400,000 tracts, mobilizing 50,000 Christians. • Mongolia: In the capital, Ulan Bator, over 2,500 Christians evangelized, including the Minister of Defence as well as a nationally renowned former criminal. Christians prayed for a woman who had been in a coma for four months. The doctors had given up all hope and were more than surprised when she awoke from the coma the following day. She has in the meantime returned to her home. • Switzerland: A young woman prayed for a person who was almost totally blind, and that person could see again thereafter. I wish to thank all of you who took part in this event for your cooperation. Only together will we be able to take in this worldwide harvest. Several leaders, including A.E. Adeboye, Loren Cunningham and the leaders of the Global Day of Prayer have told us that they believed this G.O.D. was only the beginning and that this event will grow in importance over the coming years. Please be a part of this movement and get your network involved. Each year, on the Saturday following Pentecost Sunday, the Global Outreach Day will take place, and we will be mobilizing Christians around the world to help us spread the Gospel everywhere. The Global Outreach Day and the Global Day of Prayer will come together to unite the two fundamental cornerstones of Christianity, prayer and evangelism in one weekend. This can‘t be achieved by a single person or even by a single organization, but only through the unity of the global body of Christ, where we stand, pray and work together. 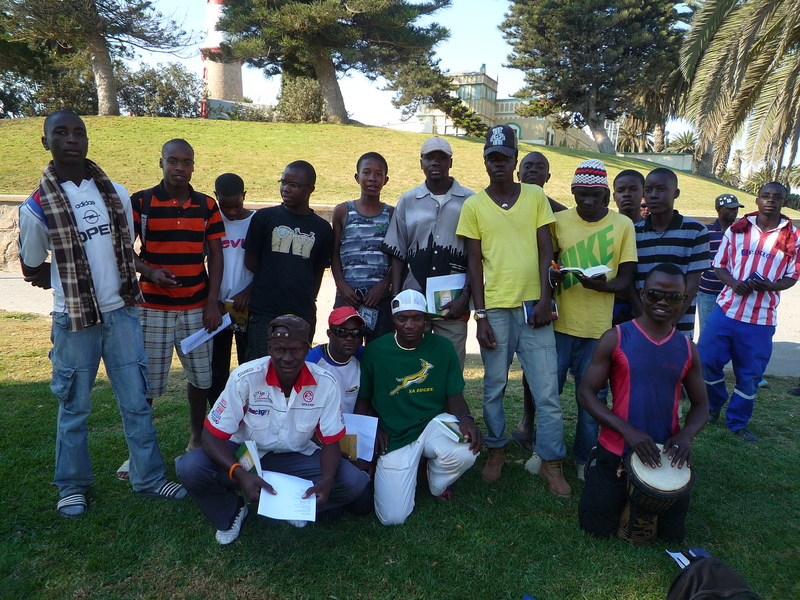 We all come from different cultures and have different ways of doing things, so let’s embrace them and use a variety of ways to reach people with the gospel like one on one, community outreach, evangelistic street meetings, music & drama etc. 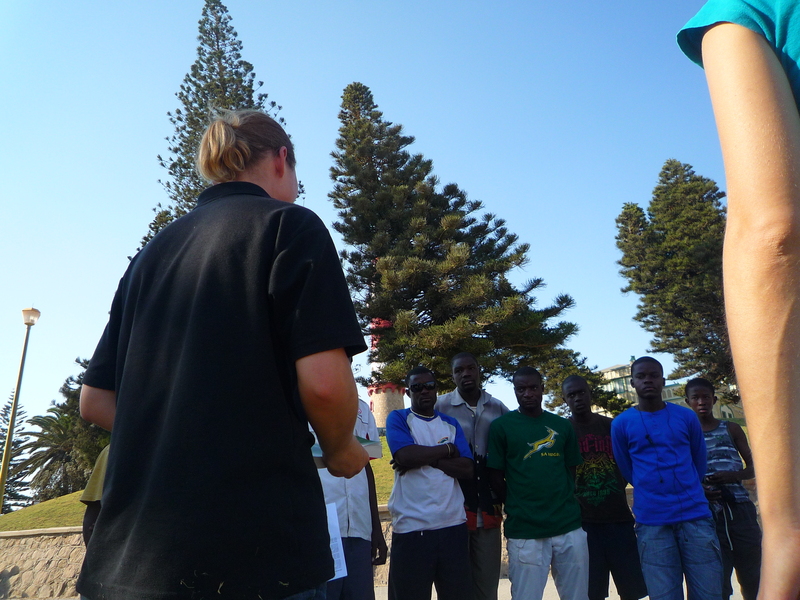 Be a part of this worldwide evangelistic outreach!